Lots of new archives have been coming online lately. So, why not give them a quick mention. CSPAN: This week, the American cable network finally completed the digitization of its vast video archive. What does that mean for you? It means you can access online every C-SPAN program aired since 1987. 160,000 hours of video in total, covering 23 years of American political history. The Times has more on this story. Popular Science: Thanks to Google, you can now freely access a 137-year archive of Popular Science. 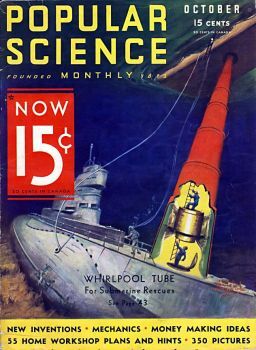 As PopSci, founded in 1872, writes, "Each issue appears just as it did at its original time of publication, complete with period advertisements. It's an amazing resource that beautifully encapsulates our ongoing fascination with the future, and science and technology's incredible potential to improve our lives." If you spend some time with Brain Picking's recent post, you'll see why the PopSci archive holds so much interest. As a side note, you can also find a vast archive of Popular Mechanics via Google Books. Just click here and, as Wired put it, "let the nerdgasmic loss of productivity commence." Spin Magazine: Google Books has also added to its virtual magazine shelf every issue of Spin, the music magazine Bob Guccione Jr. founded in 1985. As BoingBoing mentions today, it's interesting to see "how awfully dated the design of the magazine is." Great round-up, Dan. One more to consider, which was among the first to strike a Google deal in 2008 – LIFE, which released millions of never-before-seen photos dating as far back as 1750. Which brings me to another thought – I wonder what iPad app Google Books will come up with. Because one is sorely needed, if only to explore these fantastic archives in the full neo-magazine glory that the iPad lends itself to.